Sony unveils 2009 Bravia Eco TV range | What Hi-Fi? Sony is emphasising its Green credentials with its new 2009 range of LCD TVs, launched today. We've already reported on the flagship wireless ZX1 model, and and got our first glimpse of the new US Bravias at CES in January. Most of the 2009 UK models carry the EU Flower – an eco label introduced by the European Commission to certify greener, more environmentally friendly products. Other technical highlights of the new range include DLNA connectivity to let you stream music, digital photos and video stored on your PC, a USB media player and Applicast, which lets you access a range of online services without turning on your computer. Sony Bravia TVs fitted with Applicast have an Ethernet port to connect to the internet, so you can view your favourite RSS feeds and a choice of widgets. These are accessed via the XMB (Xross Media Bar) interface, similar to the one used on the PS3. The new sets use Sony's latest Engine3 picture enhancement technology, designed to optimise video signals from any standard- or high-definition source. MotionFlow 100Hz technology doubles the displayed frame rate for smoother reproduction of moving images. Many of the new models are slimmer than last year's range, and the E5500 and E5300 series feature 'Picture Frame' styling. 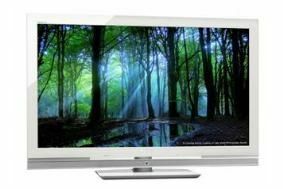 WE5 (40/46-inch): Inside the white cabinet design, this WE5 Full HD 'Green TV' (pictured above) features a new micro-tubular HCFL backlight that is claimed to reduce power consumption by more than 50 per cent. An Intelligent Presence Sensor switches off the picture when you leave the room. A new Energy Saving Switch is designed to be more convenient than switching off and unplugging to save power when the set's not in use. BRAVIA Engine3 is complemented by Motionflow 100Hz with IB reduction for smoother moving images. W5500 (32/37/40/46/52-inch): The W5500 series updates the innovative draw the LINE design concept with a deep piano black finish and transparent detailing. Motionflow 100Hz technology with Image Blur Reduction is said to create sharper, smoother images with fast-moving live action. Includes integrated BRAVIA Engine3 and Live Colour, DLNA and AppliCast. E5500 (32/40-inch): Slim, Picture Frame Full HD TV that's available in a choice of black, aluminium and walnut-effect finishes. Technology highlights include BRAVIA Engine3 and Live Colour, Motionflow 100Hz with IB Reduction, AppliCast, DLNA and USB Media Player. V5500 (32/37/40/46/52-inch): The V5500 series has a deep piano black finish. Full HD picture quality, Live Colour and the new BRAVIA Engine3 picture processing are part of the spec. DLNA lets you stream video, music and photos from your VAIO or networked home PC. New to BRAVIA this year, AppliCast displays information from the internet and on-screen widgets. S5500 (22/32/37/40-inch): Entry-level range has a contrasting piano black/matt textured finish. 37- and 40-inch models feature a Full HD panel, others are HD-ready. Connectivity options include up to three HDMI inputs plus a USB input for viewing digital photos or listening to MP3 music tracks from a connected device.